Last July, unfavorable opinions of the Supreme Court rose to their highest level in 25 years, following the Court’s ruling upholding most of the 2010 health care law. A December survey showed that views of the court had changed little since that point. 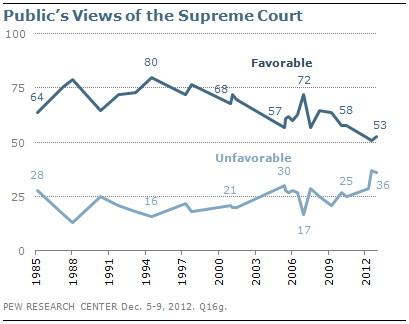 In the most recent survey, 53% said they had a favorable view of the Supreme Court, while 36% had an unfavorable view. In July 37% said they had an unfavorable opinion of the court. In addition, the wide partisan differences in views of the Supreme Court that emerged in the wake of the health care ruling remained. In the December survey, 62% of Democrats said they had a favorable opinion of the Supreme Court; that was little changed from July (64%), but 10 points higher than in April (52%).